Heavy as a newborn baby, larger than forearms, and costs approximately a Jackson . 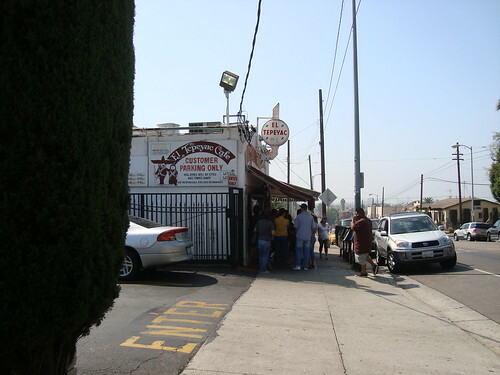 . . that can only mean one thing in Los Angeles, the over-five-pounds Manuel's Special Burrito at El Tepeyac Café in East Los Angeles; where, as mentioned last week, Binary Tastebuds faced off against Choisauce to see who can eat the most or finish the fastest, with the loser paying the El Tepeyac bill AND a no-limit-set dinner at Rivera. 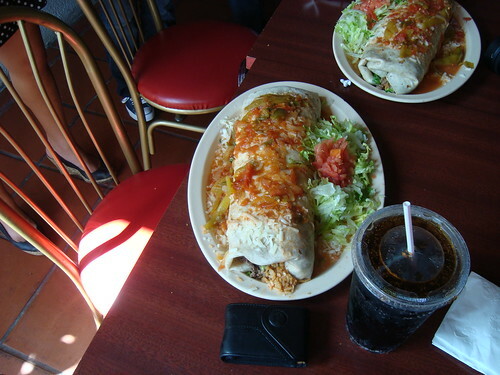 Here's the monstrous burrito, with my camera case for size comparison. Yeah, it's as wide as my camera is long! And three witnesses (left to right): Danny of Kung Food Panda, Evelina of Two Hungry Pandas, and Alan of Liquored on Life (Panda? 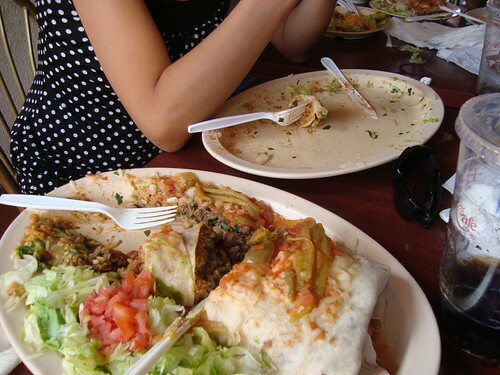 ), were there too, with more normal-size (though still unusually large) portions of and burrito, quesadilla, tostada and horchata. Conbon was there too, but she only shared a jamaica with me as we observe the showdown. 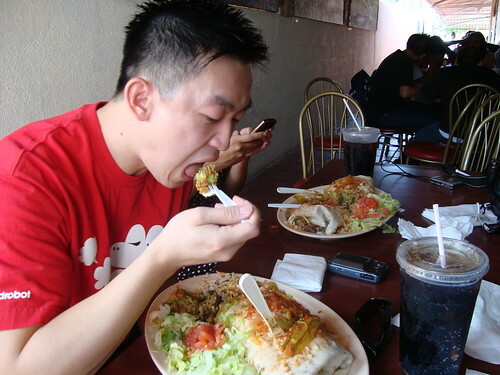 At first, both contender seem to be going strong, with Mr. BT taking the silent 'n steady route while Choisauce was texting and craptalking during the nosh fest, which he occasionally reciprocated. But after 20 minutes, the gap quickly widened . . .
and it soon became clear who's taking the Rivera prize and who's footing the bill. Here's the winner with her paper crown, ladylike mouth wipe-age, and declarations of "I WANT DESSERT!" Congrats (and oh yeah, A for Effort, Mr. BT), and I am soooo glad I don't have to see either of you in the next 24 to 48 hours. More photos (and videos) here on my flickr. 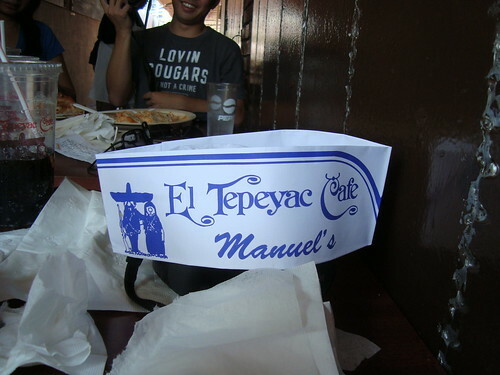 And in case you want to tackle the Manuel's Special yourself . . . It's everyone's favorite posts -- the ones with giveaways! This time, thanks to the organizer of Taste of Abbot Kinney, I'm able to give out not one, not two . . . but FIVE pairs of tickets (which are worth $60 per ticket) to the Sunday, Oct. 11 event from 2 to 7 p.m. To enter, simply comment to this post with your e-mail address/contact info and tell me what you love about the Abbot Kinney neighborhood or if you have a particular favorite eatery on that street. Benefiting Inside Out Community Arts, a non-profit that empowers youth through visual and performing arts, what I love Taste of Abbot Kinney is that it's an actual walking tour into the street's various eateries, bars and shops (instead of other tasting events where it's at some off-site venue and all the restaurants have to worry about pre-prepping the food or cooking in an unfamiliar, makeshift "kitchen.") 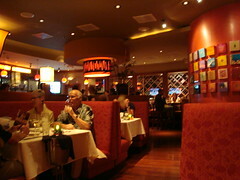 With this "Taste" you get mix and mingle (and eat and drink) in the actual restaurants with the staff and owners. Eat/drink participants for this year's event include Joe's (where I had a thoroughly delicious brunch last year), 3 Square (another nice spot for an AM meal), Lemonade, Lilly's French Cafe & Bar, The Tasting Kitchen, Capri, Elvino Wines, Beechwood and more! Furthermore, the ticket also gets you some sweet discounts at those uniquely-Abbot Kinney retailers such as Equator Books and Urbanic Paper Boutique, where you can score swanky-chic goods at a fraction of the price. Anyhoo, spread the word (pre-shortened URL for you twitter-saavy folks: http://bit.ly/Vwn3w) and comment away, 5 will be chosen at random to win a pair of tickets by the end of September (Wed., 11:59 p.m.) And of course, if you didn't win, consider buying a ticket -- between all the food, wine, spirits, discounts AND supporting a great cause, it's totally worth it! Even though it's officially Fall, it feels hotter than summer! what the...? Anyhoo, the warmer temperatures should make things (including the Manuel's Special Tourney) interesting . . .
Today only - for those who Panda Express (I do, too, on occasion -- that orange chicken is crack-laced, I swear) today they're debuting their SweetFire Chicken Breast(TM), described as "crispy all-white meat chicken, fresh red bell peppers, diced onions and juicy pineapples, wok-tossed to perfection in our zesty sweet chili sauce" and you can try it for free by bringing this coupon to your local PanEx. Until Sun., Sept. 27 - Santa Monica's french brasserie Anisette is celebrating the end of summer (and the beginning of HOTTER weather?) with a refreshing six-item Basque menu highlighting that region's fare -- including a piperade with farm egg, pepper relish and jamon serrano ($10), pork a la Basquaise with creamy polenta and chorizo ragout ($26) and fromage du Pay with cherry compote ($6). ~ SeriousEats' extensive coverage of the simple-yet-refined stir-frying method in its Seriously Asian column, from "passing through" technique, to the function of cornstarch, the assorted Asian veggies and, of course, choosing the right wok. 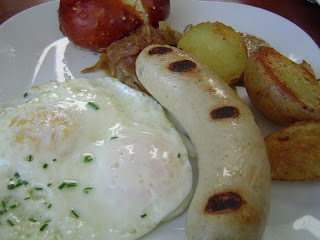 ~ Probably in perfect timing for the upcoming first ever LA beer week, CHOW.com gives a primer on German and German-style beers. ~ For the list obsessed, LA Weekly highlights Top 10 Japanese Noodles joint in the Torrance area -- and a few runner-up honorable mentions. The eating tourney to watch this weekend . . . Totally epic . . . watch, listen and smell (in awe, in amazement, in disgust?) 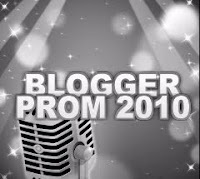 as two of my blogging friends take on . 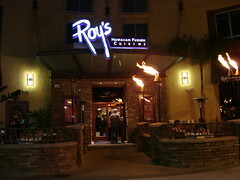 . .
Only one will survive, and win a no-limit-set dinner at Rivera! 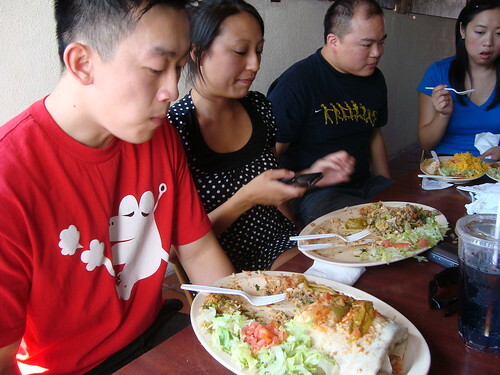 Witness the insanity for yourself this Sunday, noon @ El Tepeyac ;) - it's definitely *THE* food battle of the decade year month Sept. 27. Side bets and other orders of Manuel's Special amongst yourselves are welcomed too . . . The October tasting event I'm super-stoked for . 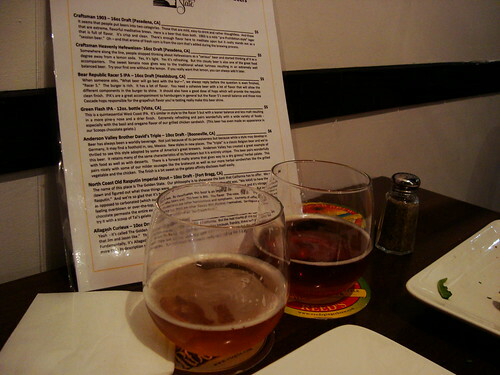 . . LA Beer Week! While most foodies I know are plotting their schedules around the DineLA restaurant weeks (which, I admit, is a good incentive to check out some "outside the comfort zone" eateries at a discount,) I personally am way more excited (and practically salivating) over the more grassroots 1st LA Beer Week (hopefully the the first of many to come.) 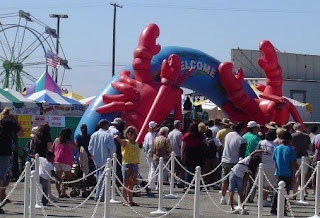 Organized by pub owners, brewers and beer enthusiasts all over L.A. and O.C., the 11-day palooza (Oct. 15-25, though there are some outlier events starting as early as Oct. 6) spans across the entire city, with festivities taking place from Naja's Place in Redondo Beach to The Back Abbey out in Claremont, even diving south to Seal Beach's Beachwood BBQ. With over 20 events (and more in the works) there's bound to be something that pique every beer snob aficionado's interest -- whether it's a Chimay-paired dinner at BOHO with the brewer who flew in from Belgium (along with a rare vintage brew to taste), or the release of Shmaltz's Freaktoberfest beer (a blood-red lager with 6 malts, 6 hops, brewed to 6.66% alcohol-by-volume) at The Otheroom in Venice or a curiosity-brewing molecular beer dinner with The Bruery at Beachwood BBQ. Even for those who are barely dipping their toes and are still learning and feeling their way through the world of beer, there are more educational, introductory going-ons like the Beer & Cheese 101 tasting & pairing seminar at Pasadena's Arroyo Whole Foods megaplex. Finally, for those that are mindful of their budget (like I am this month with my dine-out dieting), you can always sign up to be a volunteer. While you won't be able to drink at the Festival, it does get you into the exclusive Oct. 25 volunteers-and-brewers only BBQ, where I am sure plenty of beers will be a-flowing too. For details and latest updates, check out their web site here. Hope to see you at one or more of these events! The best banh mi I've ever had . 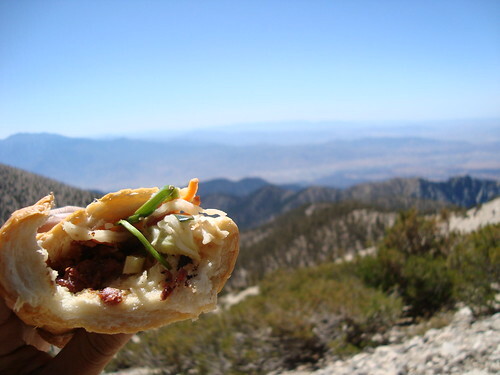 . .
An overnight-chilled, smooshed flat and partly sogged up (from adjacent water bottle) banh mi bo nuong (charbroiled beef Vietnamese sandwich) . . .
. . . but as a disclaimer, this is after in the midst of an intense dayhike/deathmarch up and down the Vivian Creek Trail to the summit of San Gorgonio Mountain. I guess hunger, and high-attitude-induced delirium, does make the best sauce afterall. Of course, I had the infinitely tastier, fresh version straight out of Banh Mi My Tho (my favorite V-wich shop) too. And it was all kinds of delicious with the peanutty spread, pickled veggies, fresh 'n cool cucumber, slightly sweet BBQ'd beef and the occasion spicy slice of chili pepper smacked between crispy-on-outside, tender/chewy-on-inside baguette. Next time I'll just remember to keep it away from the liquids in my backpack . 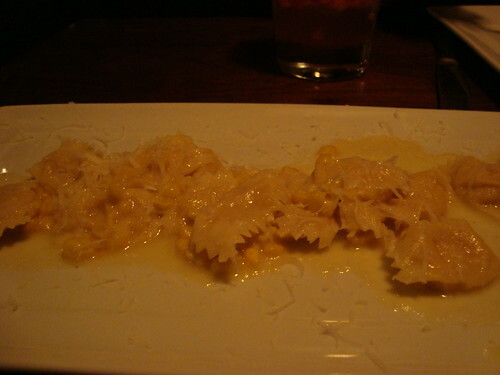 . .
After my order, I was served this plate of edamamme -- now normally I'd nibble on only a few pods, but I found myself munching away at half this plate before reluctantly asking the busser to take it away so I don't get full before the actual food comes. These weren't only a little salty but also a little spicy and sweet with citrusy, peppery and even nutty notes as well... and sure enough, my brain just went "A HA!" 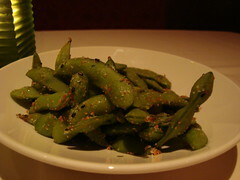 when the server informed me the edamamme here are tossed in a little sugar and shichimi togarashi as well. What an easy-to-do upgrade that I'll surely do next time I'm serving these up at home! The miso-glazed seared lobe of foie gras came with a yamamomo and a orange wakame soy butter; at first I wasn't sure if they meant soy butter as in some vegan butter derived from soybean, which sounds like all sorts of wrong since it's served with foie, but upon tasting realized that it's butter flavored with soy sauce along with orange and wakame. And it's really tasty, butter infused with wonderful citrusy-sweet fragrance of orange, the sea-briny taste of the wakame and a wee bit of the soy's umami. The foie gras itself was a solid, but not spectacular, preparation -- the sear was perfect, but the flavor is very one-dimensional, duck fat w/o a hint of liver-ness. As the yamamomo, it's my first time trying so I can't say much about it (it tasted like a boysenberry to me) though it might be better if served pitted next time... not very modern-upscale upon discovering I have a seed to spit back out with the first bite. 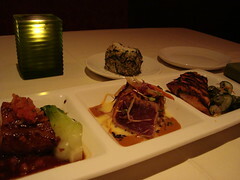 The Roy's classic trio consisted of the (left to right) Hawaiian-style misoyaki butterfish, the Hawaiian blackened island Ahi tuna and hibachi grilled salmon. 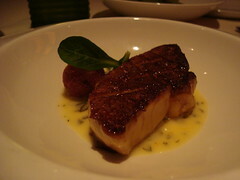 The butterfish tasted super-similar to its relatives, the black cod and Chilean Sea Bass: soft, moist, buttery and wonderfully complemented by the savory-sweet miso glaze and the bok choy. The rare seared ahi tasted pretty standard (fresh and good but not particularly noteworthy) but I did love the wonderfully spicy nostril-opener of a soy-mustard butter sauce (a wonderful spin off the wasabi & soy sauce). Surprisingly, the most lackluster of the trio was the salmon with citrus-ponzu -- despite taking the server's recommendation of having it cooked to medium, it wound up being overcooked a bit and was too dry for my liking. 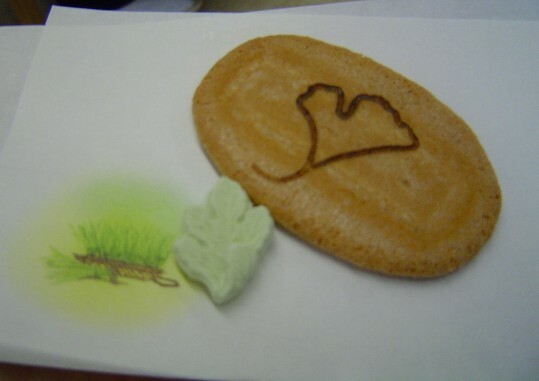 The accompanying sunomono was alright though. Nonetheless, I appreciated the three different preparations of this trio and it's a great to be able to sample several smaller-sized entrees for the price of one -- also props for their sensible portions! Ultimately, it's hard to compare this to the other Hawaiian joints I usually frequent since it's so drastically different, I wouldn't come here expecting a plate lunch and spam musubi anymore than I would expect Aloha Food Factory or Shakas to serve foie gras and have an expansive cocktail & wine list, so it's better to appreciate each variety for what it is. Well so far my dine-out diet has been going well, it's nice to cook a little more at home -- and thankfully, there were the kindness of "strangers" (a.k.a. food pr folks) who invited me to assorted events, so I was not a total recluse from the scene. Nonetheless, still fairly bummed out that I'll be missing the following fun going-ons ~ but I can already see the light (a.k.a. October) at the end of the tunnel! Ends Today - Royal/T, the funky japanese maid cafe/art space/shop, is known for its occasional temporary shops and specialty menus, and this week they've been collaborating with maven Hannah Beth for a "Things I Love" Pop-Up Shop. In additional to some of Hannah's favorite cute jewelry and accessories, Royal/T also crafted a menu full of her favorite healthy nibbles, including grilled artichokes with lemon aioli ($8) and Cheesy Gardenburger with Fries ($10), or you can just stroll the space with a glass of Veuve du Vernay sparkling rosé for $5. But it all ends tonight so swing by if you're interested. Sat., Sept. 19 - Taste the lesser-known flavors of Vietnam with Jame Beard nominated chef and "Southeast Asian Flavors" cookbook author Robert Danhi as he takes you on a culinary tour through Little Saigon to taste specialties from the Northern Vietnam region, including bo luc lac (soy glazed shaking beef with pickled onions) bun cha Hanoi (grilled pork patties with vermicelli and green papaya) bun tom co ngu (sweet potato and shrimp fritters) and many more. Plus at the end he will demo a recipe from his cookbook (which you'll also receive). This tour (as well as a Central Vietnam one on Oct. 17 and Southern Vietnam on Nov. 21st) is $75 per person, but if you sign up for three it's only $175! Mon., Sept. 21 to Sat., 26 - Dine like a celeb at Studio City's Pinot Bistro, since during this time they will be serving the same menu that they catered for the Primetime Emmy's Governor's Ball. The $60pp prix-fixe includes "flavors from the farmers market" a playful variety of seasonal veggies like eggplant caviar & chips and layered multicolored potato salad, filet mignon with polenta ravioli, roasted zucchini blossoms and pinot noir sauce, and silky smooth milk chocolate infused with raspberry creme alongside yuzu gelee and mint lollipop. And you don't even have to deal with the paparazzo! Wed., Sept 23 & Thurs., Sept. 24 - DineLA Restaurant Weeks are around the corner and if my past experience are any indication, it's hard to make enough time (and money) to check out all the participants I'm interested in. So Joshua Lurie a.k.a. 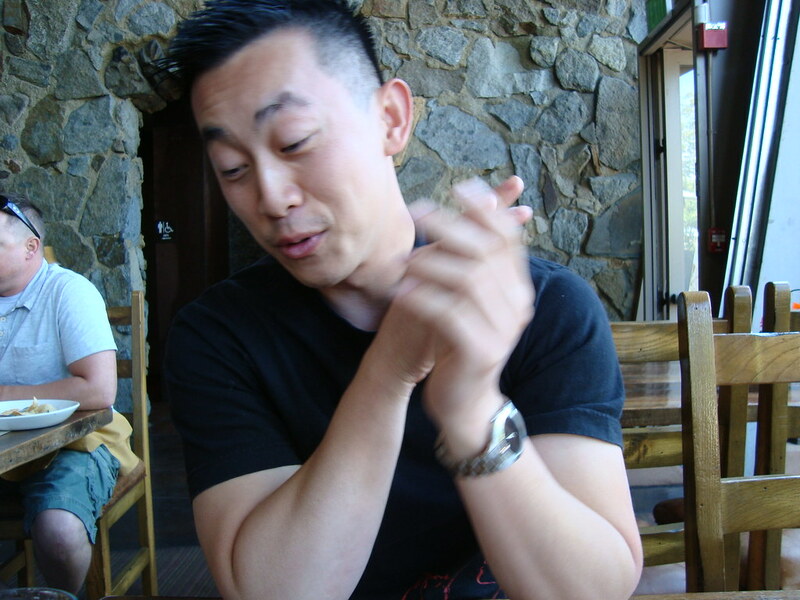 FoodGPS is definitely onto something when he organized a progressive dinner tour of some DineLA Resto Week eateries. On Sept. 23, a $39pp dinner includes tastings at the Whist at the Viceroy, Dining Room at Hotel Shangri-La and Anisette Brasserie. 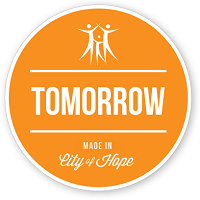 On Sept. 24, it's a $49pp downtown Latin-American focused tour of Ciudad, Provecho, Rosa Mexicano and Rivera. Do both and you get a $5 discount! Wed., Sept 23 & Fri., Sept. 25 - LearnAboutWine is bringing back its Riedel wine tasting again! Once more, Riedel Crystal USA's CEO Max Riedel will be hosting these sessions to showcase how the shape of a glass really makes a difference when tasting various wines and spirits (as I found out myself earlier this year.) the Sept. 23 tasting takes place at Snyder Diamond in Santa Monica, and the $69 event comes with a 4-glass Vinum series set while the Sept. 24 session is held LearnAboutWine's downtown haunt, and the $90 event comes 3-glass Sommelier series set. And of course, the priceless experience of meeting and learning from one of the premier glass makers in the world. Thurs., Sept 24 - Century City Breadbar's Hatchi is back again, this time it's an "Endless Summer" menu with Remi Lauvand (formerly of Citrus at Social). Just like the previous one-night gigs, it's 8 courses at $8 per dish -- and this month's menu includes house cured Tasmanian trout with tarragon and lemon hatch pepper relish, octopus with handmade farfalle and chicken oysters and orchard pear crepe with walnuts and goat cheese. Thurs., Sept 24 - It's a food-meets-vodka adventure at Akasha, where Chef Akasha Richmond teamed up with the makers of TRU Organic Spirits for a spirited dinner highlighting market-driven, Indian-influenced fare. Start off a reception with spicy mixed nuts and a passion fruit martini made with chile, candied ginger & hibiscus, then move onto snacks of croquettes and pakoras with a trio of chutneys and a gin & tonic made with home grown curry leaves, a very complex, sophisticated family-style chicken curry paired against a bloody mary with tomato water & pickled cucumber, and finish off with some TRU-infused sorbet and ice creams along with Akasha's homemade ginger & black pepper chai. It's $45pp+tax and 20% service charge. Reservations required. Meanwhile, A Hamburger Today puts out a guide to the different burger styles out there; think you know the difference between a slider and a mini-hamburger? As A) an only child, B) being born in the midst of summer and C) basically a latchkey kid w two working parents, I've long been used to celebrating my birthdays with the company of me, myself and I. In fact, I even prefer it, since the few occasions I've had bigger b-day celebrations, it was more stressful than its worth -- having to pick a place that everyone will like (particularly for those with mainstreamed palates or penny-pinching budgets,) figuring who should I invite and whether the personalities will match or clash, dealing with lame-O excuses and even more lame last-minute cancellations, and OH - the very public faking of the giftgasm, which I don't do well. 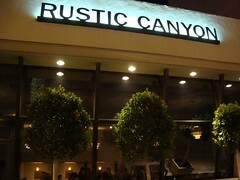 So for the past few years the only b-day celebration are the ones with my folks, and this year my Mom reciprocated my Mother's Day gift to her and we went to our new favorite find: Rustic Canyon Wine Bar in Santa Monica. Starting off our celebration on the right foot, we toasted with their fresh-fruit prosecco cocktails, the nectarine-smashed Nectar of the Gods and the obvious sounding Strawberry Muddle - delightful sparkling sippers that are nicely accented by their respective sweet and ripe fruits, and a nice compliment to the complementary plate of olives soaked in herb-infused oil. For appetizer, we got the nectarine and burrata salad, accented with microbasil, and drizzles of olive oil and saba, a syrup made from grape must. 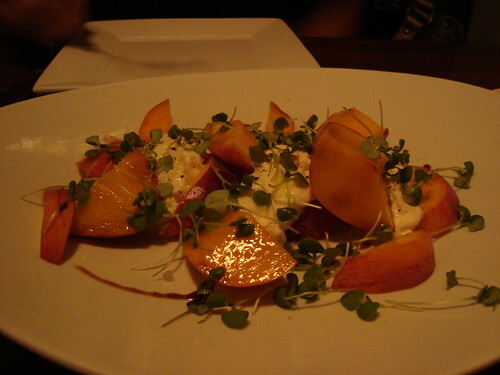 In short it's a spin of the caprese salad, substituting the richer burrata and the nectarines for the tomatoes. We both liked the lighter, sweeter flavors of this salad (made even more so by the saba), and it definitely felt more appropriate for a warm summer night than the more robust traditional caprese. 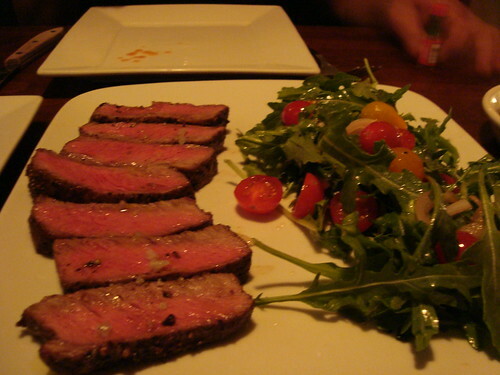 For the main, a medium rare flat iron steak with arugula and heirloom tomatoes. The steak was wonderfully cooked, meltingly tender and bursting with juicy flavors with every bite. The vegetables, normally an afterthought for both the kitchen and the diner, were well worth eating to the very last bite here too -- refreshingly ripe and totally representing what fresh produce should taste like. 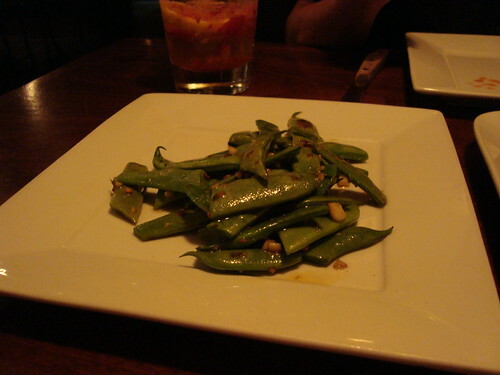 And even though it was a birthday dinner and we were tempted to order french fries to go with the steak, we opted to be a bit healthy and went for the blistered romano beans instead, which to our delight had a nice crispy snap too sans all the fried carb guilt. 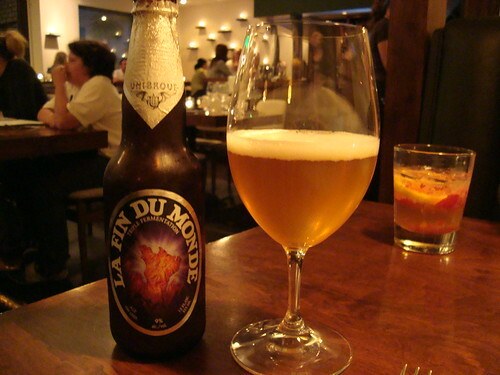 I also ordered a bottle of the La Fin du Monde, a Quebec-made beer in Belgian style; it's so wildly complex, in juxtaposition to the simply prepared cuisine, but just as tasty. 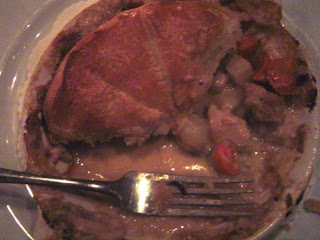 Toasty, spicy and fruity with lots of fizz and a medium-rich body - it definitely breathed new life into the food when I ate it with the steak and veggies. Finishing off, of course -- is the dessert, which of course is no-bars-hold for me even on regular dine-outs, let alone for a birthday meal (as you can tell by my fork-mark before photo-ing)! 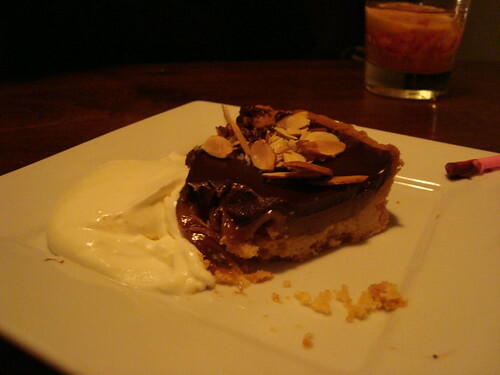 salted caramel dark chocolate tart . . . deep and creamy with just a tinge of salt for complexity against a crumbly shortbread-like crust, this decadent sweet is worth every extra mile I have to run in the days to come. Just like the rest of this as-perfect-as-can-be birthday meal --- thanks Mom for sharing (and of course, footing the bill) Dad (who couldn't make it 'cause of work) for his b-day gift that I didn't have to fake a giftgasm for and of course, thanks Josh Loeb, Evan Funke and Zoe Nathan plus the rest of the Rustic Canyon staff for continuing to dish out such fantastic meals that makes every stop there a special occasion! 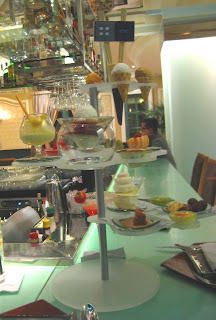 Dare I tackle Sensi's dessert tower this time around in Sin City? When this gets published I'll still be in Las Vegas (making my annual pilgrimage since early Thursday) . . . wish I had more to say this Friday but frankly I can't think that far ahead! So anyhoo, here's a really quick foodie event rundown for this coming week . . .
Sunday, Sept. 13, 5 p.m. - AMMO Restaurant is re-doing their Farm-to-Table dinner with Windrose Farms & Tablas Creek Wine after the unfortunate incident last time around involving the sprinkler accidentally going off and flooding the restaurant midway through the meal. Hopefully no indoor rainy season this time around, especially with such a sumptuous menu highlighting the seasonal bounty. Again, $45/person and $30 for wine pairings. Monday, Sept. 14, during "Monday Night Football" - new Studio City sporty gastropub Henry's Hat kicks off with "Halftime Hilarity" where during half-time comics will perform short sets and after the game the resto will offer rotating eats and select draft beer pitchers for half-price. The deliciously affordable items for this comic Monday includes North Carolina-style pulled pork sandwich w coleslaw for $4.50, Banana Split with housemade fudge and strawberry sauces for $3.50 and Chili Con Queso w Salsa for $4.25. Sounds like a reason to swing on by, even if you aren't into the pigskin! Till end of November - Downtown's Nick and Stef's Steakhouse will be celebrating their 10th anniversary with a 3-course prix-fixe for $39.95. Selections include tomato salad with onion and baby arugula, oak wood grilled filet mignon, pan-roasted organic chicken and lemon meringue pie with blackberry honey. Sounds like a great opp to get your meal on before or after checking out a performance in the downtown theaters. And those already with rezzies for tomorrow's White Trash Tasting at Colorado Wine Company, I'll see you there bright and early! Being a sucker for all things sugary, when I was attending a blogger pal's post-wedding bash in downtown LA, I took the opportunity of my early arrival to check out the soft-opened Syrup Desserts, a café specializing serving up sweets, coffee and tea until fairly late at night. Could have great potential as an after-dinner, post-show or following-barhopping spot . 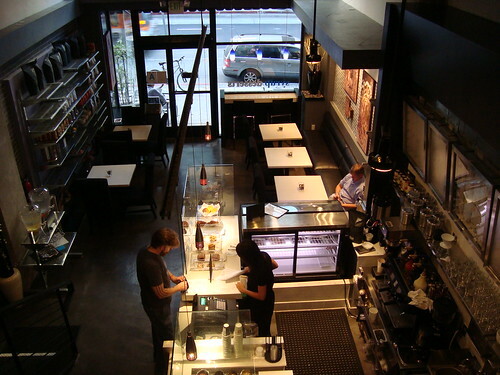 . .
Having been to chi-chi dessert lounges of the East Coast and more casual bakery-cafés that just serve great sweets, I didn't know what to expect in terms of Syrup's environs. 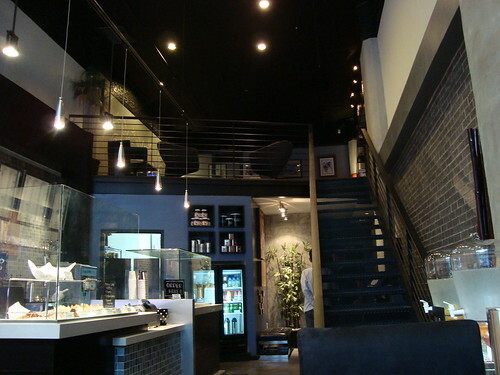 It was actually kind of a mix of both -- the downstairs had a more laid-back coffeehouse vibe, while the upstairs loft had a swankier lounge feel with cushier sofas, coffee tables and even assorted board games neatly tucked away. So it's appropriate whether you want a quick grab-and-go, a brief sweet bite or linger around longer. More daunting, however, is their menu -- which easily has over 50 items just for eats alone (and at least another 30 more for beverages). 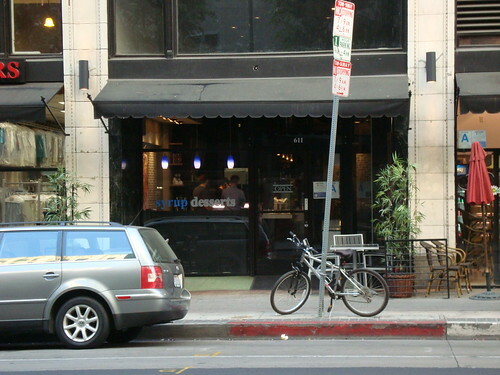 Syrup is definitely ambitious with its offerings, which included: waffles, crepes, sweet grilled cheeses, ice creams, frozen yogurts PLUS assorted cakes and baked goods. Even though a lot of the ingredients are easily mix-and-matchable (a strawberry crepe vs. strawberry grilled cheese vs. strawberry waffle, for example) their casting such a wide net still makes me wonder if they can do any item well. 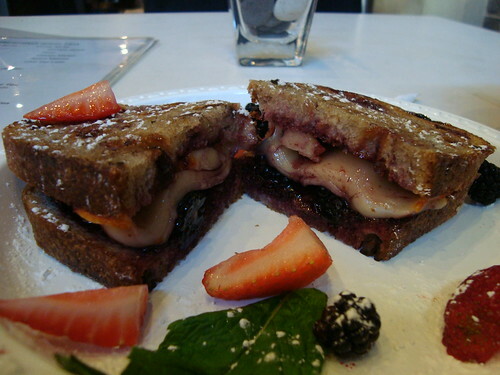 Since the sweet grilled cheeses were the most unique of their offerings, that's what I got -- more specifically a Blackberry Grilled for $5.50 - with fresh blackberries, blackberry preserves, crushed walnuts and muenster cheese between slices of Texas Toast bread, along with a side of fruit. 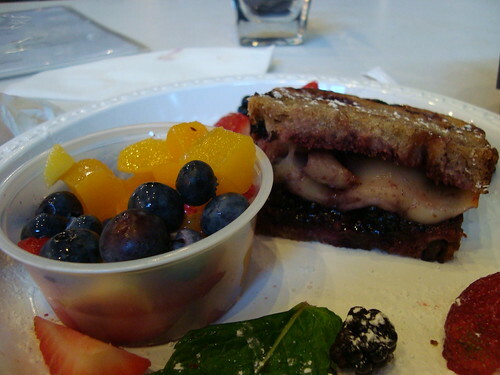 The version I got were actually served on raisin-walnut bread instead, but otherwise it was pretty good. The globs of the creamy, slightly-savory cheese worked well against the fruity-sweetness of the preserve and the distinct tang from the smashed up berries. I wish it got grilled just a little bit longer though, so that the bread would get that ever-so-thin layer of crispy (if carcinogenic) black char and the cheese would be REALLY hot 'n gooey instead of just warm 'n slightly stretchy. The accompanying fruit cup is a nice extra touch, but nothing to write much about, it's basically an assortment of the bite-sized fruits they'd top their froyo with. 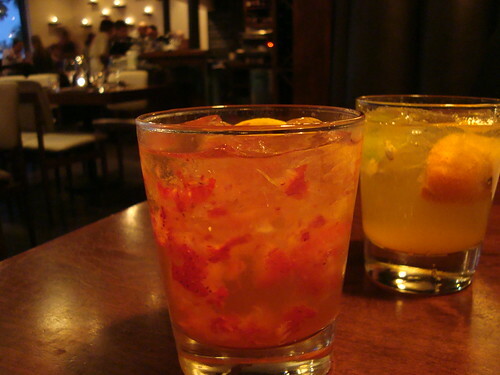 I am also intrigued by their habanero-lime iced tea; alas, they ran out -- but overall, I think it's a great concept. 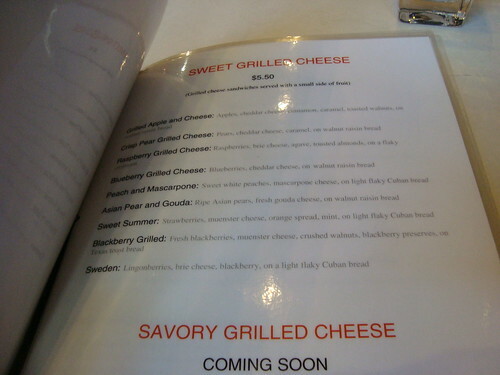 Hopefully they do just a good a job with their other dessert items, but for me the sweet grilled cheeses are definitely the draw (since I have yet to see such an extensive menu of those around town.) Maybe I'll even cobble a group together on my next trip so I can taste the Peach & Mascarpone, Asian Pear & Gouda and Apple & Cheddar sandwiches all at once! And to try that intriguing tea . . .
Well then, not even one week in and my dine-out diet has already been foiled, twice in the same day (a.k.a. TODAY) -- an unexpected early morning duty at work left me high and dry (and far away from home) in the breakfast department so I settled for some a.m. nosh at 3 Square in Venice (yeah, my arm was REALLY twisted there ;) ) and tonight I gotta toast to another foodblogger's celebratory news in downtown LA. Here's hoping I can make away with one drink... and maybe a snacky bite. Saturday, Sept. 5: At Henry's Hat near Universal City, they're throwing a helluva sports party -- with all the hot college football games playin' while serving food and drinks (including bottomless mimosas and sangrias) at half-off for those showing up in college gear. Time to whip out and dust off those gianormously logo'd clothes from your alma mater! Sunday, Sept. 6 and Monday, Sept. 7: For many, Labor Day signifies the true end of summer -- or at least Ford's Filling Station thinks so, since this Sunday and Monday are the last days they'll be doing the Summer BBQ from 4 to 10 p.m. For $18/person, diners can choose two meats including brisket, pulled pork, Tuscan sausage and pork ribs PLUS two homestyle sides such as succotash, Southern style Tuscan cabbage, and marinated heirloom tomatoes. For Sunday, add a draft beer for $4 more -- while Monday that $4 draft will be offered all night long, no limits and no food required. Now until Wednesday, Sept. 9: In sync with Santa Monica Pier's 100th anniversary, FIG will be offering assorted gussied-up junk foods for $5-14. Themed around "on a stick" "on bread" and "in a basket" - the specials include blue cheese-filled buffalo chicken, scotch duck egg, lobster corn dog and a pancetta burger with sun dried tomato relish. 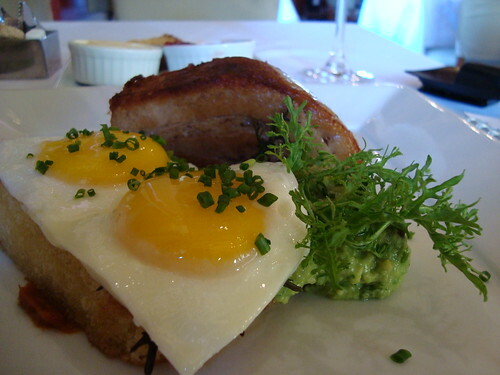 For full lowdown, menu and prices, check out Caroline on Crack's post here. Wednesday, Sept. 9: Also celebrating the pier's centennial is Le Troquet, the swanky outdoor bar of the Le Merigot Hotel & Spa, will be having food & drink specials nearly all night long from 5 to 11 p.m., with 30% off their Le Troquet menu (tuna tartare, crab quesadilla, steak au poivre) and 50% off well drinks excluding beer/wine. Sounds like a great way to enjoy the fireworks and festivities!